Yesterday was my “blogiversary,” the four-year anniversary of my inaugural post here on Ever In Transit. I decided start EIT after discovering a few travel blogs back in 2011. Launching the site was my New Year’s resolution at the turn of 2012. It’s the only New Year’s resolution I’ve ever kept! Instead of cupcakes this year, per my annual tradition, I celebrated by baking scones. Why? Well, I found a jar of lemon curd in my cupboard that I got as a Christmas gift last year (!) and figured it was as good a time as any to crack into it. In 2016, I’ve got some new New Year’s resolutions here on EIT: I’m getting serious about achieving a more consistent post schedule–I’m trying to stop going ten days without a new post, then sharing four in four days. Second, I’ll want to make sure I’m sharing things you want to see. I’ve been wanting to do a reader survey for years and I’m finally working to put one together. Third, I want to plan more and in-person tours and events. A few people have asked me to plan organized day tours or food, so I’m figuring out the feasibility of launching one here in California in 2016, and perhaps one abroad, next year. At the very least, I want to host a few more SweetsCrawls and other reader meetups this year. Where should SweetsCrawl go next? Let me know in the comments! By the way, the scones turned out great — they were rich and crumbly, and so easy to make. Give them a try and let me know what you think! Add the flour, baking powder, sugar, salt, and butter into a food processor. Pulse in the butter until the mixture resembles a coarse meal. If you don't have a food processor, mix the butter into the dry ingredients with your fingers until it is the same texture. Add the liquid to the dry ingredients and stir in quickly with a wooden spoon until a soft dough forms. It should be a little sticky. Don’t over-mix the dough or your scones will not rise well. Make small balls of dough and press them lightly onto a parchment paper lined cookie sheet. I used our large cookie scoop (approximately 3 tbsp) so that they were uniform. Brush the tops of all the scones with the reserved milk and egg liquid. 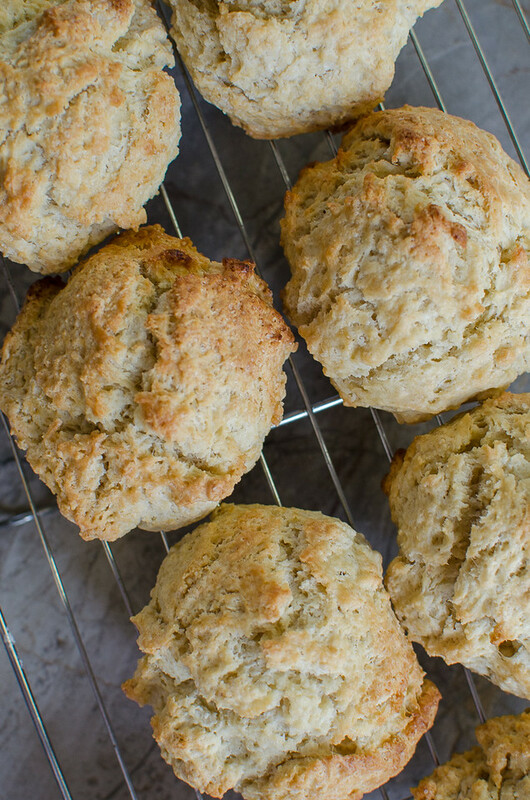 Put the scones into the heated oven and cook for about 12-15 minutes or until the tops of the scones are evenly browned. Cool on a wire rack. Serve with clotted cream, jam, or lemon curd. We used this fun (and delicious!) Downton Abbey-branded lemon curd I got for Christmas. Adapted from this recipe that I found on Pinterest. What are your New Year’s resolutions? Or goals for 2016? Do SF again! Things change so fast in the city and it’s been a few years since the last one. Any event in the area, you know I’ll try my hardest to be there:-). Also, (dog-friendly) hiking events! Anything to get outside! SF is on! Check out the list that Janice put in her comment–what else would you add? Looks great!! I am so bad with food in the city. Just tell me where to be and what time, and I’m there! Haha, I always forget how close Sacramento is! I haven’t been once since I moved here:-). (I startet my blog in 2012 too! :-)) . Wonderful! Happy blog birthday to you, too! And we can all use more wildflowers in our lives. I look forward to seeing your illustrations! 🙂 Happy new year to you, Matthias! I’m inspired to make some scones and also try my hand at lemon curd as I have a lot of lemon juice on hand. Thanks for your thoughts and your traveling adventures. First of all…happy blogiversary! 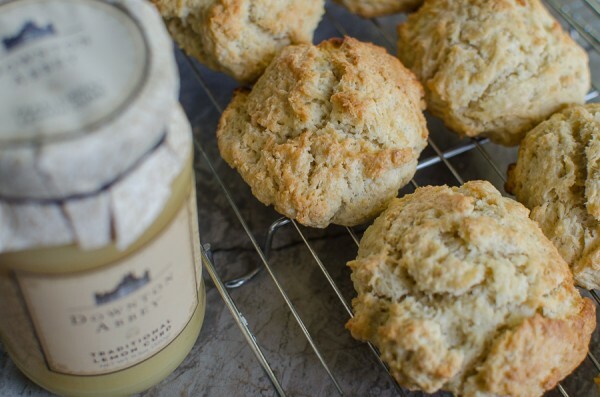 Those scones look perfectly delicious, especially with Lemon Curd. I think you just wrote our next SF itinerary 🙂 We did Dandelion Chocolate on the last one and I think we should definitely go back there this time. So I’ll plan to do SF, Sac, and San Jose this year. I’m thinking early May for the first one, so we can hopefully get past the rainy season. I’d love to plan international culinary group trips in the future, but I need to work out the logistics of that. But I would love to do Paris and/or Lyon–Kevin has a few former coworkers who just moved back to Lyon, so I’m sure he could help… hmmm, so many ideas! I look forward to meeting you soon, Janice! Hmm, actually–maybe we should do Sacramento in May and SF in August or Sept? I hesitate to do Sac in the summer because of the heat. What do you think about that? I’d love you to be at both of them to show us around 🙂 Let me know some Saturday (or Sundays) in each month that would work for you! Cassie -> check out San Fran’s on Valencia -> Craftsman and Wolves menu = their sweets selection will make you go 😀 😀 😀 @ http://www.craftsman-wolves.com/caw-valencia/ !!! I made the scones two days ago as soon as I read the recipe. Made it as is, but added some left over blueberry sauce that I had from making another pinterest recipe, so they were delicious blueberry scones. Very moist. Had to bake them about 10 minutes longer than the recipe said – probably because the moisture from the blueberries. The blueberry french toast with streusel and blueberry sauce was devine also, if you get a chance to try it. Happy New Year and congrats on the 4 years blogging. Still have done nothing about getting my blog out to my friends. it’s a new year. I have new younger friends who will likely be able to help me with it. Wish me luck. Love reading your blog. Hugs to you and happy new year! Congrats on your blogiversary! Sweet crawls or just food tours in general sound great. Anywhere local works for me, maybe even Sacramento? Thanks, Rene! And that’s great that you would be interested in coming up to Sac–I’ve gotten a few requests for there so I’d love to do one up there this year. And we could carpool! I’d also love to do a San Jose one, including my favorite Mexican and Vietnamese sweets places (both on Story Rd), but we’ll have to have people carpool and drive from stop to stop. Any ideas for San Jose–neighborhoods or businesses? Thanks, Noel! They are, and they’ve inspired a Downton Abbey themed tea party that I’m planning for next month to celebrate the end of the series 🙂 Yay!